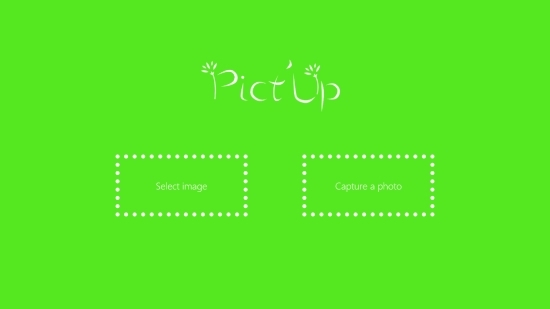 Pict’Up is a free Windows 8 Photo Editor app that lets you modify your photos by applying beautiful effects to them. 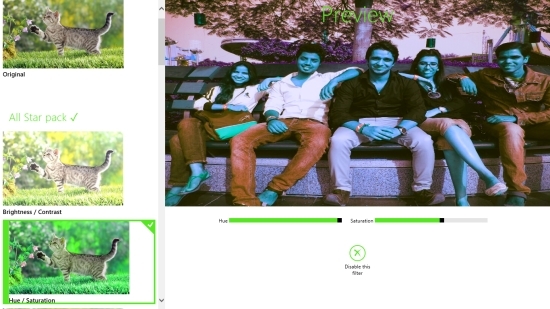 Using this free Windows 8 Photo Editor app, you can apply different types of amazing effects to your photos with just a single click. We have already covered many photo editor apps from Windows Store that are capable of turning your photos with new highlighting effects. However, this app is a unique one. In this app, you can not only apply different types of special effects to your photos, but also adjust them to match your perfection point. You can select an image from your Pictures library or take a picture directly from the app (using webcam) and apply visual filters on them. Apart from 4 free interesting effects/ visual filters, the app offers more effects that can be purchased and used. The app also offers to save the new images on your system in png format. You can share these images as well. Pict’Up can be downloaded freely from Tools category of Windows Store using the link given below at the end. 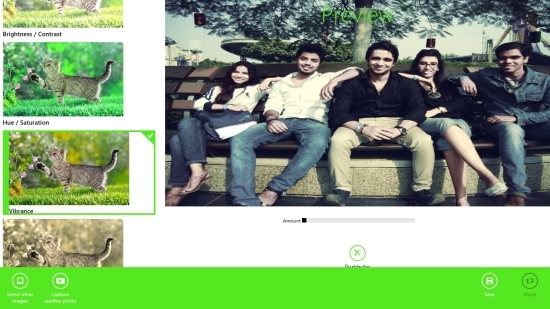 Let’s have a quick look at this free Windows 8 Photo Editor app. The Start screen of the app looks clean with only two options displayed on a nice lively background. The options are: Select Image and Capture a photo. You can either select an image from your system or take one directly from the app with your webcam. Brightness/ Contrast, Hue/ Saturation, Vibrance, and Sepia. Click on an effect to apply to the selected image. A preview will be instantly generated and shown in the screen. Adjust sliders displayed below to get your perfection point. You can click on Disable this filter option displayed just below the preview image to get back to your original image. To save this new image, right click on the screen. The app’s bar will display options Select other images, Capture another photo, Save, and Share. Click on Save button, select an output folder destination and save the new image. 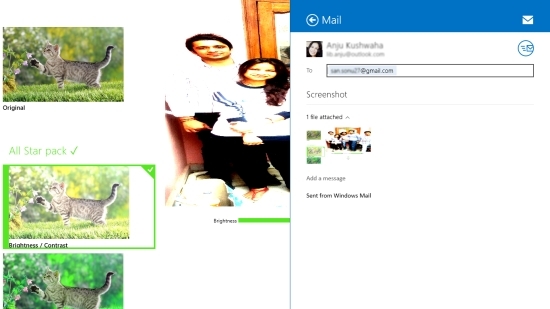 You can also share this new image via e-mail using the Windows 8 Share charm. Though the app’s bar is equipped with Share option but this doesn’t seem to be working properly. Pict’Up is a nice and simple Photo Editor app. Though it offers a limited number of free effects, but its ability to adjust these effects widens the scope. However, the Share option on the app’s bar doesn’t seem to work. Still worth trying an app. Check this out to apply cool effects to your photos. Share your feedback via comments.